Head spins around 360 degrees. Solar powered, about 2 feet tall. Used as a fish predator deterrent. $5.00 Easy to anchor down with fishing line. Adds a little something to your pond. $24.00, Convenient to have when trying to round up fish. 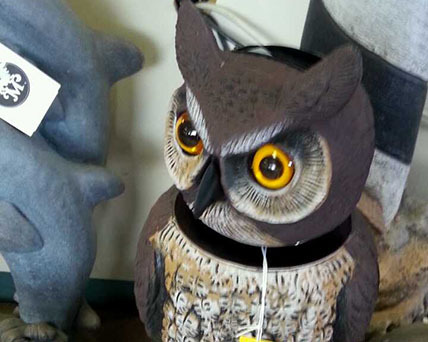 $79.00, This owl spins it's head round and round. $120.00, You get 3 hallogen submersible lights that all hook into a transformer. Color options as well. $8.00 per lbs, Carbon will help purify your water, place near high water flow. $35.00, Green Clean is a powder that kills algae on contact, works like a charm. $14.00 for 3, Use 1 tablet per month, clears murky water and breaks down sludge. $20.00, Want black or blue water? We carry water dyes safe for fish and plants. $9.00, We have Ph and ammonia test kits. They last a long time. $0.15, Wrap these around submerged plants to help sink them. 1 per plant. $3.50, It's nice to have plant containers. Mesh containers.